The ruling New Patriotic Party (NPP) will retain political power in the 2020 general elections, says Bernard Antwi Boasiako, the Ashanti Regional Mr Chairman. Mr. Boasiako, who is affectionately called ‘Wontumi,' stated that nothing can stop the party from massively defeating the opposition National Democratic Congress (NDC) in 2020 since the current Akufo-Addo administration has put Ghana on a sound footing towards economic prosperity. He said NDC is making what he called 'diabolical' plans for 2020 elections but the good works of President Akufo-Addo would convince the electorate to kick them out. Wontumi stated further that the NDC has nothing good to offer the country and so they (NDC) would not capture power from the NPP. According to him, Ghanaians appreciate the splendid works of the NPP so far. 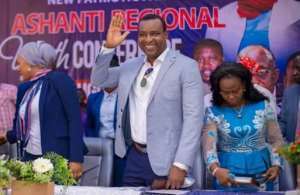 Wontumi also charged the youth wing of the NPP to work hard and commit themselves towards the party’s victory in 2020 and commended them highly for their efforts in 2016. “The NPP youth is the strength and the future success of our great political party, and we are banking our hopes on them to help us retain political power. Ghana’s transformation and success depends on how best you can campaign for the party to win election 2020,” Wontumi stated. Second Lady, Samira Bawumia, Henry Nana Boakye, aka Nana B, NPP National Youth Organizer and Simon Osei Mensah, the Ashanti Regional Minister and a host of NPP officials were in attendance.